The Minnesota Historical Society has several Ojibwe made fiber mats in their collection. 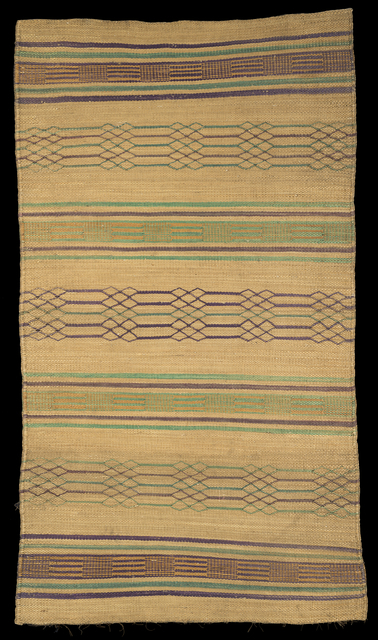 This particular mat is made from bulrush and basswood with green and purple dyed rushes weaved to form a geometric design. Other fibers, like cedar or sage, were commonly used to produce these kinds mats as well. 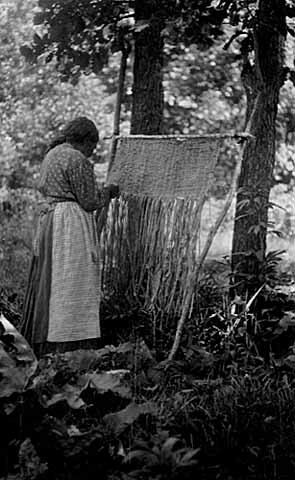 Pictured below is an Ojibwe woman weaving a bulrush mat, circa 1910. There were several different weaving techniques employed by the Ojibwe and these were sometimes dependent on the fiber used. These mats had multi-functional uses such as floor and door coverings, sleeping mats, and drying mats for wild rice. Photograph by anthropologist Frances Theresa Densmore, to see more photos and items collected by her please visit our collections site.